With so many aspects of public education dominating our national attention, it has never been more important for educators and policymakers to move away from polarized debate and instead find common ground through collaboration. Bridging the gap between policy and practice has been the focus of much of my career. I have had the great fortune of working for organizations and school districts where we have been able to rethink and reclaim failed school reform efforts to make them more responsive to the needs of students and staff. Embracing high standards does not have to result in standardization of practice. Curriculum coherence does not have to come at the expense of the artistry of teaching. As educators, now is the time for us to bring our expertise to bear and create the schools systems that all of our students deserve. 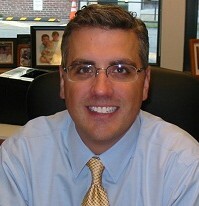 David is serving as Superintendent of Wellesley Public Schools. He was a high school history teacher in Massachusetts, where he earned National Board Certification and was named the Massachusetts Teacher of the Year in 2000. A White House Fellow, David later served as Associate Director of Domestic Policy in the Clinton and Bush Administrations. David served as policy advisor to the president of National Board for Professional Teaching Standards and later as research director the. Prior to coming to Wellesley, David was the Executive Director of Educator Quality for the Austin Independent School District. He holds his doctoral degree in educational leadership from Harvard.